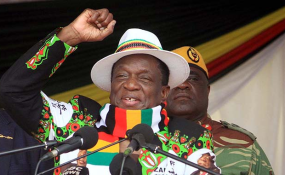 President Emmerson Mnangagwa says he was surprised by the recent wave of increases in prices of goods and services as he went on to urge business operators to lower them. He was addressing traditional leaders in Kadoma on Monday. "We were surprised to wake up one morning to an outrageous increment of a 50kg back of maize seed from $30 to $100," he said. The President said he could not understand why some businesses still went ahead to hike the prices when they were being assisted with foreign currency through the central bank. "We are however surprised to see the same businesses charging their goods in US dollars when, as government, we are giving them forex. They must charge using our own currency, the bond notes," he said. Prices of goods and services in Zimbabwe went up three times in the past two months owing to the fall of the local bond note against the more stable US dollar. The hike is also blamed on Finance Minister Mthuli Ncube's unpopular introduction of a 2 percent tax on all electronic transfers in Zimbabwe. The President further said that he had met with some business leaders at State House a few weeks ago over the matter and they pledged to rectify the situation. "When we met them those who had hiked their prices indicated that they had lowered," he said. Mnangagwa appealed to the conscience of local business people in the interest of the suffering masses. "We will continue engaging business people. We are appealing to their conscience, to be humane so that they will not burden the citizens," he said. The President said it was unjustified for pharmacy owners to charge in US dollars whilst they were not paying their workers in hard currency. "I met with pharmacy owners and had to ask them if they are paying their workers in US dollars considering that they are charging in Trump's currency. "They are not, so it's not justified. After we told them that we were going to revoke their licences we saw them accepting bond note and Real Time Gross Settlements (RTGS)," he said.